A vigorous growing, warm climate grass. 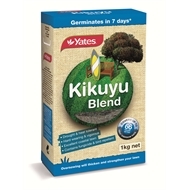 Kikuyu is excellent for high traffic areas, coastal gardens and drought prone districts, in frost-free regions of New Zealand.Fast germinating Ryegrass minimises soil erosion and reduces weed competition while the Kikuyu seedlings establish. Yates Lawn Seed is specially designed to make it easier to establish new, or rejuvenate existing, lawns from seed. We start with professional quality turf type seed and then optimise its performance with our ACTive-GRO Advanced Coating. Using the latest in coating technology, seed is treated with a lightweight film coating that protects against fungal disease and bird theft.